Bowie needs a home, and other notes. The first item of note is that I’m having some serious foot issues, and until they are resolved, new reviews will be coming slower, if at all. The second item of note has been provided by Vicki Sabo, who raises Tibetan Spaniels OTP, and as far as I know, is the only Tibetan Spaniel breeder in the state of Georgia. Our dog is a Tibbie, as they are called, and we’ve come to know Vicki as we bought our animal from her. I’ve had a rescued Tibetan Spaniel in my home for the past 7 weeks. This poor boy (I call him “Bowie”) has a sad story. I had met his owner at dog shows a few years ago. We became friendly and discussed traveling to shows together the falling spring to save expenses and have companionship. However, she developed leukemia that winter (a result of chemo as a child) and died that winter. The husband had not been real involved with the dogs, but now had 16 plus an elderly aunt that lived with them. He put the 6 male dogs (not neutered, I assume, as this boy wasn’t until recently) in the basement during the day. A couple of the dogs were large, and Bowie was “picked on” by the other dogs. Eventually neighbors called animal control on this man, as there is a limit of 3 dogs in his county. The animal control supervisor lives one block away and has kept pressure on him reducing down to 3 dogs. Only two of the dogs were tibbies, and he kept the female one. He contacted me (I had offered to help him) and brought Bowie over. Bowie had a severe flea reaction and had lost most the hair on his back end (although bathed the night before, he was still covered in fleas). He was also rather skinny. But the main help this dog needed was LOVE…he was terrified and very skiddish. In fact, the dog was in my backyard (half-acre) when the man left, and I could not get him to come in, he just kept running from me. I had to have the man come back! I kept the dog on collar and leash for the next several days until I was sure he would come to me. Fortunately, it only took a couple days for this dog to bond to me, he was so appreciative of attention and affection. He really enjoys the company of my dogs except for my boys who were aggressive to him once they discovered he was intact. He is now a happy, healthy, very handsome dog. He was well-bred and could have finished his championship. However, he had a severe marking habit that few people could tolerate, so he was neutered. Just one week after neutering, his marking behavior has curtailed greatly, and I will continue to work with him with hopes of eliminating that entirely. Other than initial shyness and marking, he is the perfect pet. He loves to take walks, will ride in the car quietly, does not object to crating at night in my room, and plays all day with other dogs here. He likes toys and has some cute quirks. He is very gentle and sweet and is in excellent health. I am asking for reimbursement of expenses only-neutering, shot, etc. Let me know if you can’t open the photos, It gave me a funny error message that I ignored and was able to see them when I checked. Oh,BTW, he is just turning 4 years old and is about 15 lbs. PS The ideal home would be able to keep him inside in a gated area with no carpet until he loses the desire to mark. He will potty on papers if needed. He uses the dog door here to go outside. You would need to devote the first couple days to making him comfortable. Your house and yard MUST be escape-proof as Bowie may be very skiddish again in a new situation and would be impossible to catch. He must be pottied on a leash the first days to prevent having to catch him. Trust me, this dog is worth this early inconvenience. If this dog interests you, and you need Vicki’s contact information,it can be found in the breeder’s list of the Tibetan Spaniel Club of America. 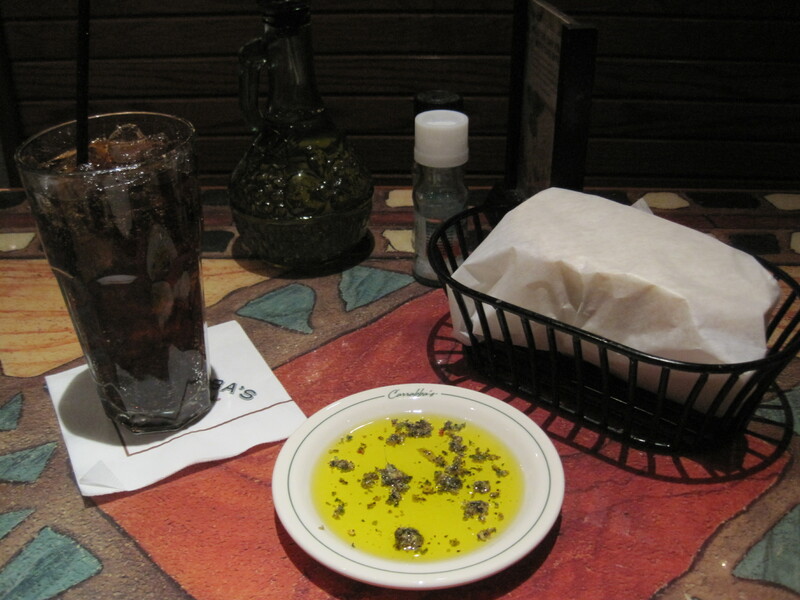 I really like Carraba’s Italian Grill. I like the service, which is exceptionally good for chains in its price range. I like the bread, fresh, tasty and excellent. 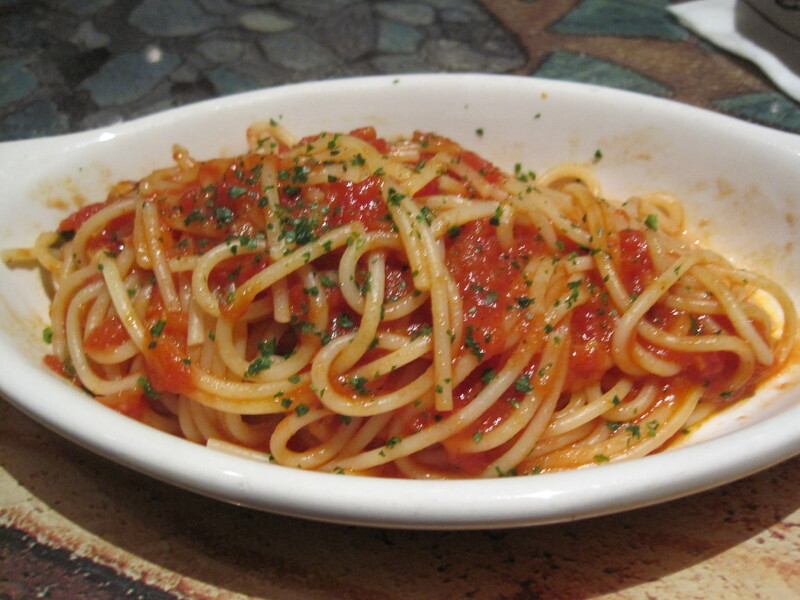 Most times I get into Carraba’s and I can’t get past the spaghetti and Italian sausage, which are very good. I came here recently for lunch, because I was in the area. 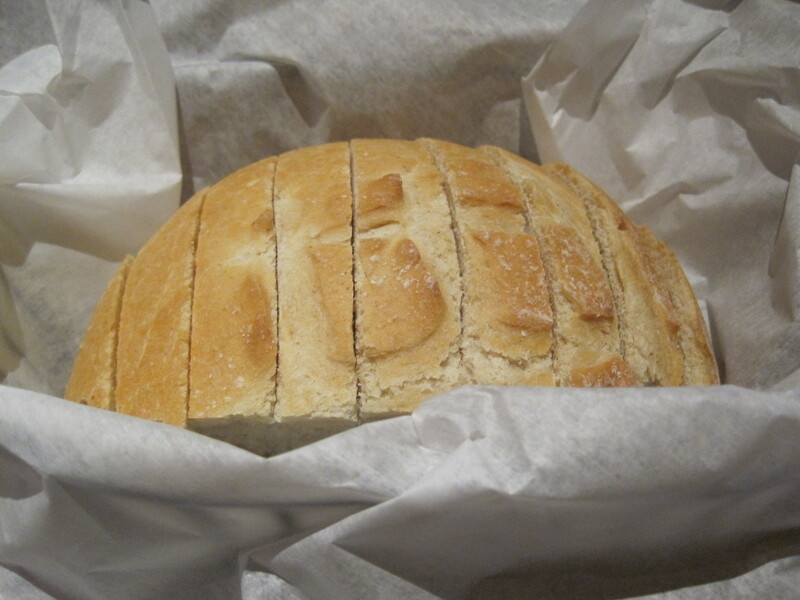 They started, as usual, with a very good loaf of bread. 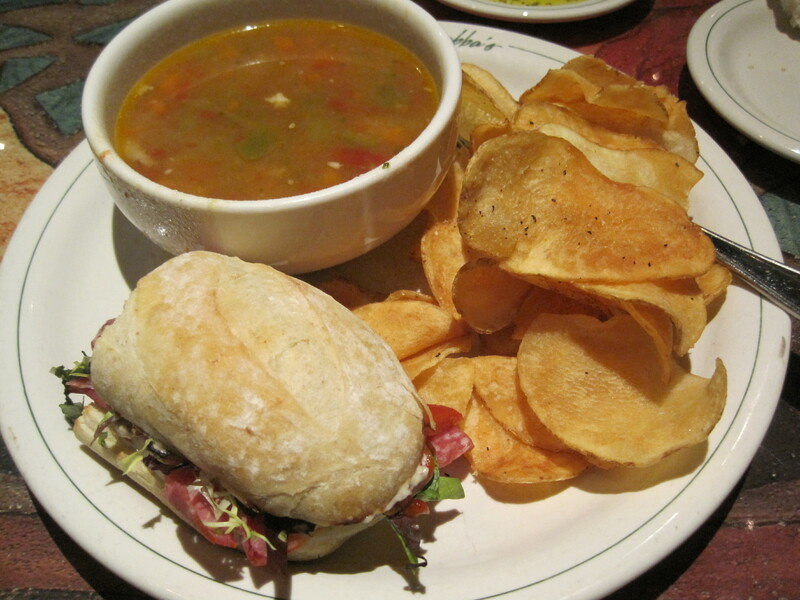 Just to change the routine, I had a soup and sandwich this day. The combo included half an Italian panini and a bowl of their spicy chicken soup. My waitress, excellent, offered me the choice of chips or pasta with the entrée. I chose pasta, and when chips arrived anyway, soon a serving of pasta was on my table. The soup was good, and had a hint of spice. The sandwich was crusty and tasty. I don’t think either was as excellent as the spaghetti and sausage, but I have a serious soft spot for a good sausage. Verdict: Good Italian eatery. Excellent bread, excellent service. Highly recommended. 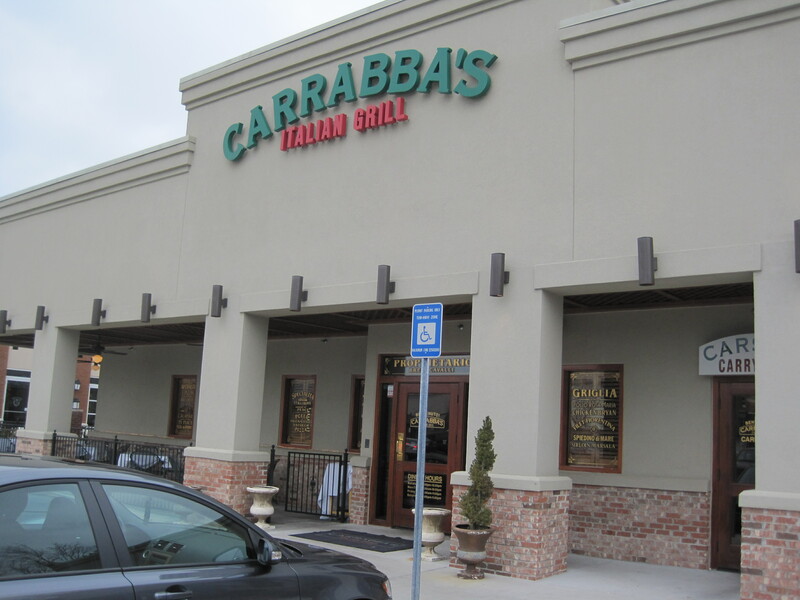 Note: Amy on Food has a recent review of Carraba’s Italian Grill. 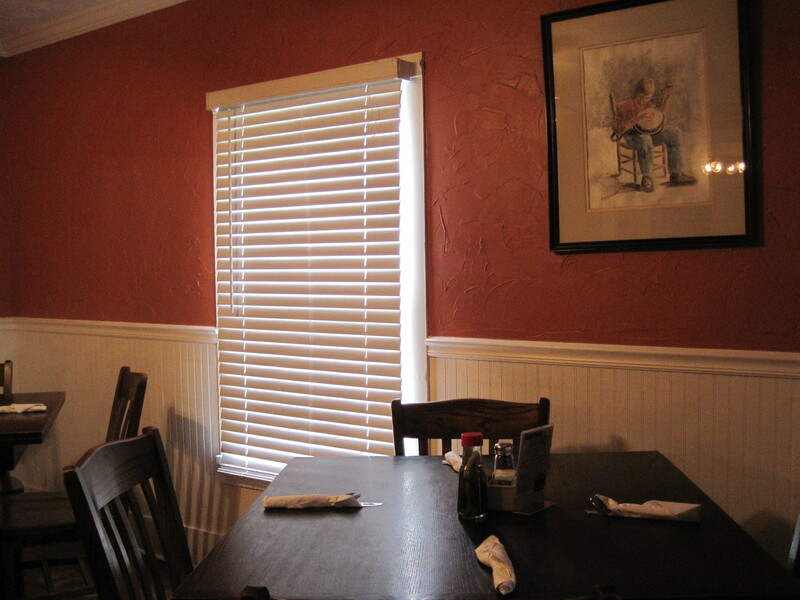 Greenwoods, a restaurant founded by Bill Greenwood and located on Green Street in Roswell, has an over twenty year history of seating customers and satisfying appetites. 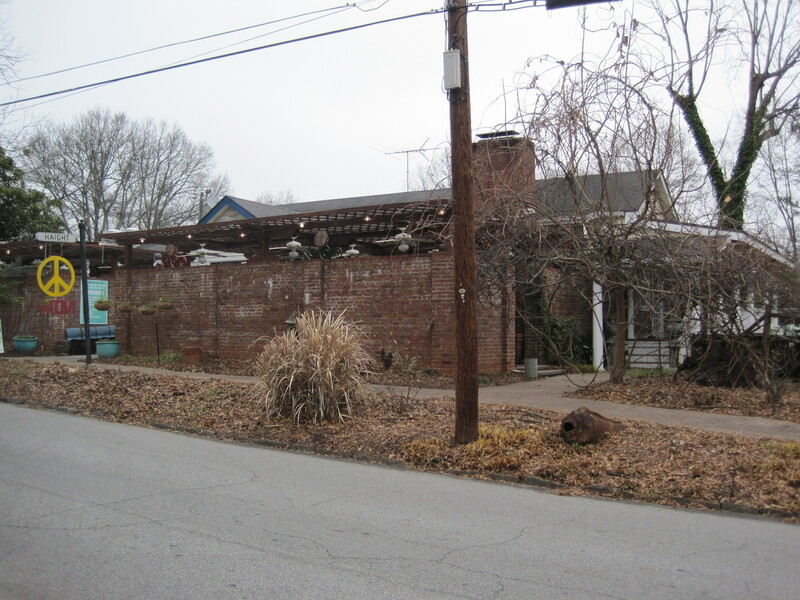 Like so many other restaurants in the historic district of Roswell, this one is carved out of a house, brick walls and wooden sides the dominant elements as you approach. The grounds are quirky. A black truck frame sits on one side, and figuring out where the entrance lies presents a bit of a problem. I followed sidewalks and opened the first door I found. Luckily it was the right door. Staff and patrons were friendly this lunch time, the patrons telling me this was going to be some of the best food I’d ever eaten. In the various rooms, tables were a dark brown, the color scheme was a white and dark orange, and paintings could be found on the walls. Greenwoods is well known for its chicken dish, but I have a serious weakness for duck, and was pretty sure before I came that I was going to try their duck with plum sauce, and that’s in fact what I ordered. It comes with two sides, and I asked that the plum sauce be placed on the side. 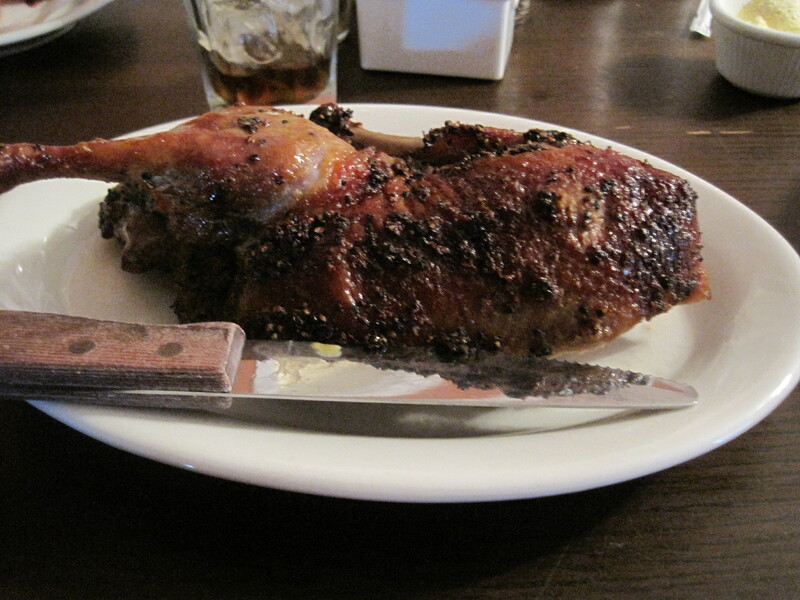 I was told it would take 20 minutes to prepare my duck, and in advance they left a good cornbread on the table. It seemed shorter than 20 minutes to me, as the duck arrived quickly. It was a good looking bird, with a pretty skin and dusted with cracked peppercorn. It tasted fantastic. The duck skin was crisp. The peppercorns were a nice touch, adding heat and flavor to the skin. I could have the duck with the spice of pepper, or pour on the plum sauce and add the sweet and fruit flavors the plum sauce provided. The collards surprised me. They were a little dry and they were tart. I liked the change, thought the collards were well worth eating. The black eyed peas were decent but not outstanding. Serving size was really large. There was enough food here to feed me for two meals, not one. The cost overall was comparable to a mid priced steak house, but given the generous portions, a group could eat rather cheaply here by sharing entrées. 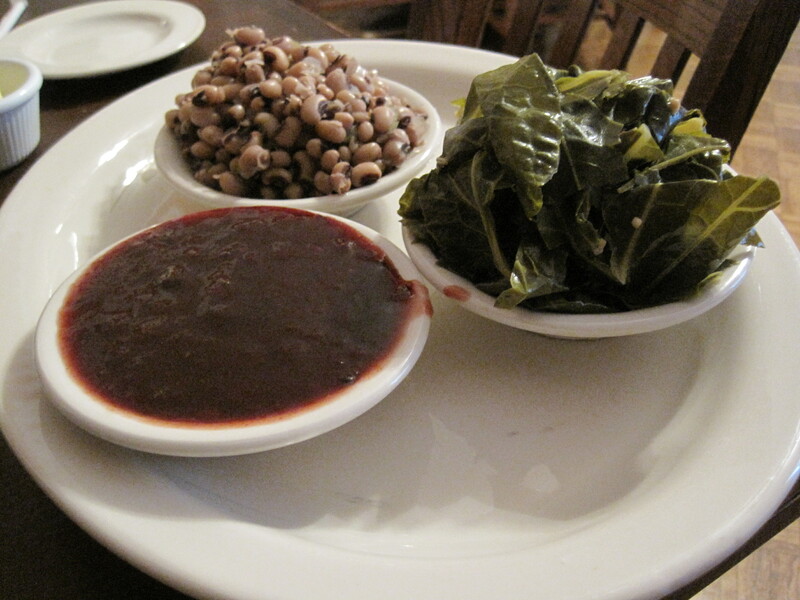 Left to right: plum sauce, black eyed peas, collard greens. My overall impression is that Bill Greenwood’s restaurant deserves its reputation. The duck was excellent, the service was good, and the patrons largely enthusiastic about this icon in Roswell. Verdict: Excellent traditional eatery in the heart of Roswell. A great duck. Highly recommended. 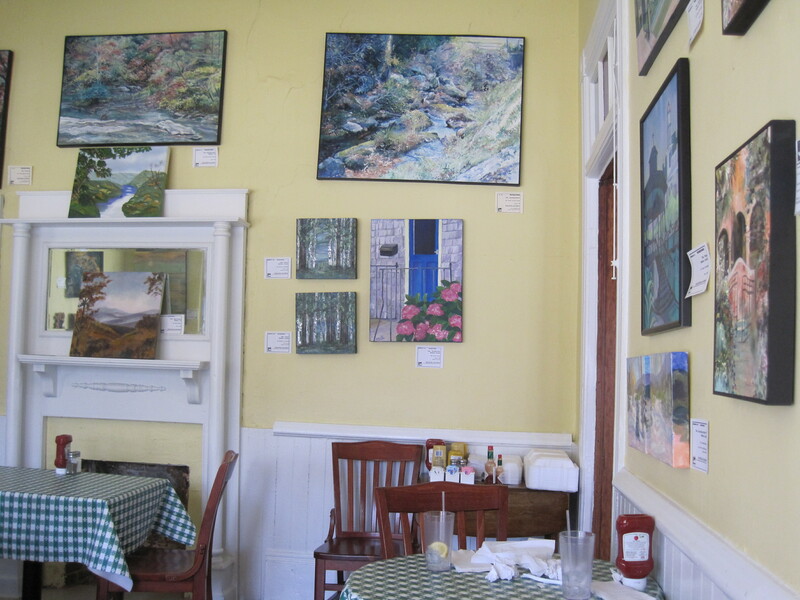 Notes: Lindsey Z’s Adventurous Tastes and the blog “..and the eggs” have interesting, useful reviews of Greenwoods. 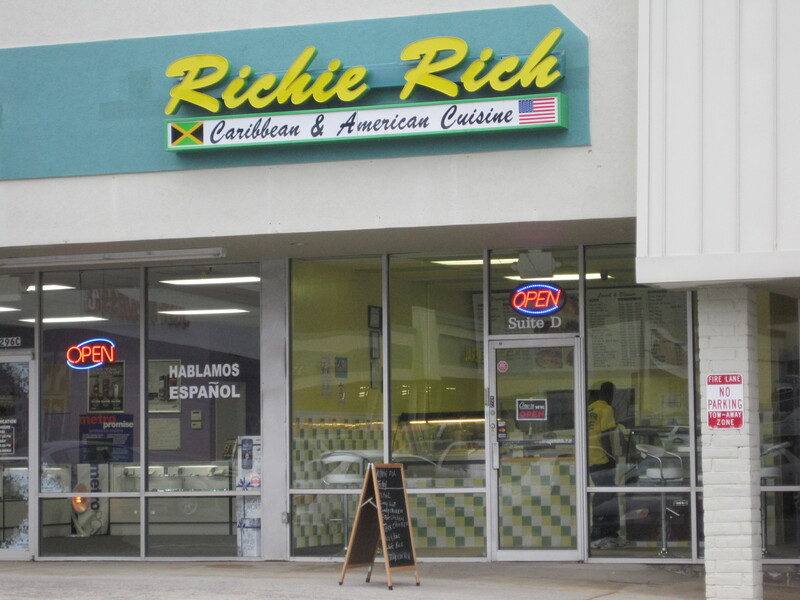 Richie Rich is a small one man Caribbean eatery in the L shaped strip mall found near Highway 78 and Henry Clower Boulevard. It’s away from Highway 78 and hard to see unless you’re in the mall parking lot. Once inside, there are only two tables with 4 chairs. The restaurant is really intended to be a take out place, more than anything else. I had been trying to get to this restaurant a while with little success. On a recent weekend I had to work, and decided to drop by after my work day was over. Finally it was open! 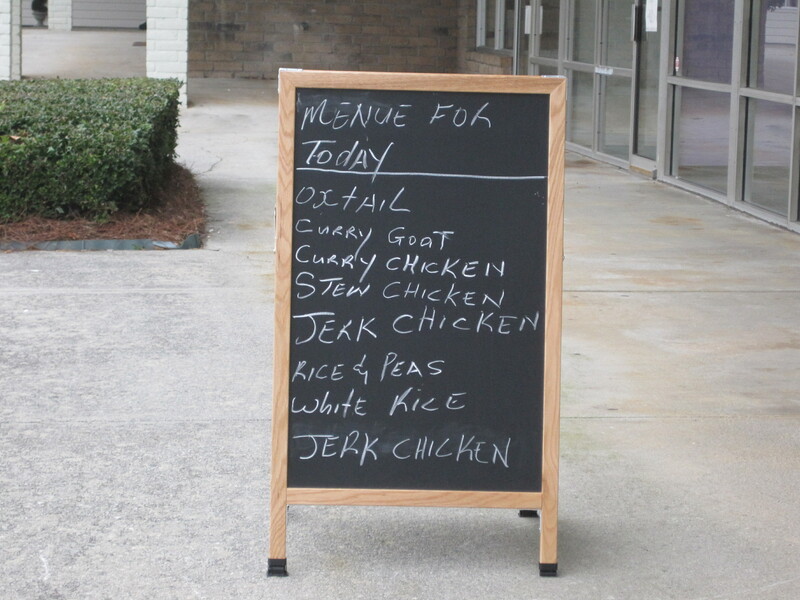 There was a blackboard outside with a list of entrées available. Food plates are available in three sizes, small, medium and large. 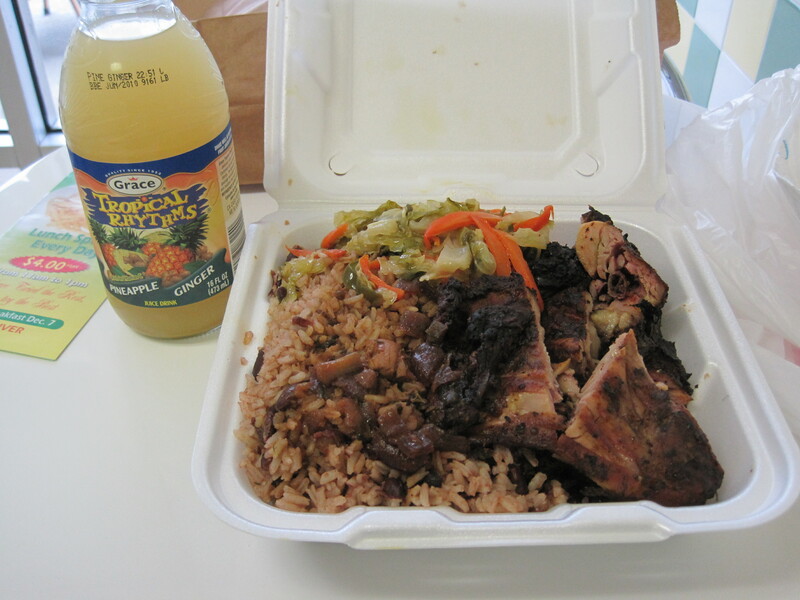 An order of oxtail, curried meats or jerk chicken is usually accompanied with peas and rice and also some vegetables. If you want, gravy can be poured over the peas and rice. If they serve patés, I didn’t see any this day. I ended up with the medium jerk chicken plate and Grace Tropical Rhythms Pineapple and Ginger drink. The jerk is a dry jerk at Richie Rich and you can smell and taste the smoke in the meat. It was quite tasty and pleasing. I like it when I can smell the smoke in the meats I’m eating. The gravy (which I believe came from the stewed chicken) added an unexpected sweetness to the peas and rice. The drink had both sweetness and some bite to it, a kind of delayed reaction ginger beer effect. I liked what I had. I’d tell you hours of this restaurant, but none are posted. I’m going to assume it’s open for lunch and dinner, but whether it’s 5 or 6 days a week is anyone’s guess. I believe it’s closed on Sunday but again, without posted hours I can’t be 100% sure. Verdict: Small restaurant with a good dry jerk chicken and decent sides. Recommended. What should be done about Access Atlanta? If there is one thing to be said about the AJC food staff, love or hate them, it is that they are professionally trained, know how to write and can write. Sometimes they write beautifully, the kind of prose you want to read over and over. It sure would be nice if there were a search tool that allowed access to, oh, all articles by Meredith Ford from 2005 inclusive. You know, a nice text field were you could say something like “author=Meredith Ford, year= 2005, subject=food” and go for it. Instead we’re faced with the interface of Access Atlanta. Access Atlanta is more a dream for advertisers than readers. The interface is cramped, the interface is slow. The whole site acts as if was never seriously tested with the target audience that would try to use it most. More so, Access Atlanta doesn’t seem to be able to keep food articles that were once there. The hundreds of broken Access Atlanta links around the internet are proof of that. The number of lost articles that can’t be recovered, even by searching on the site, is proof of that. Access Atlanta is the La Brea tar pit of food articles; articles check in, and soon are lost forever. Contrast that state of affairs with the New York Times, where it’s not all that hard to use a web search and find an article dating to the 19th century. It’s a waste of the AJC’s greatest culinary resource, its long history of excellent food writing over the years. It’s a crime to the authors of the work, it’s a crime perpetrated on readers like me. I’m not much for self promotion, but I suspect it’s time to do so. According to Urbanspoon (about the only metric that I know of) I have more Atlanta reviews than all but two independent blogging sites, and those reviews have been accumulated in a little less than 11 months. In late February this site will be one year old. This metric, of course, does not count newspapers, who more and more no longer have feature writers and instead have bloggers. And it includes Blissful Glutton, who makes her living by reviewing restaurants. It doesn’t include sites that aren’t “into” using Urbanspoon as an iPhone link, though that seems a little silly to me. What’s more I am more often these days in Urbanspoons top 25 bloggers worldwide. Now that I believe is a bit of faint praise, but it’s real. I think it speaks more for the penetration of iPhones and blogging in general into the Atlanta market than it does how fantastic the site is, but once again, it gives people a sense of where this blog has been, and how much work has been done here to provide content to readers. Some of this output has been by design. There is no way I can compete with a professional food writer, any professional, with long extended reviews, given my typical 50 hour week and long commute. The only way to distinguish myself in this crowded medium is to publish short and fast. Sometimes, the reviews will be awkward, because of the time scale on which I have to publish. Other times, I’ll be the only one publishing a review of a restaurant. I really like forgotten restaurants, those that the popular crowd has passed by. But in all I try for a mix, and in particular seeking out good, inexpensive, independent restaurants. Those are the most fun to find. Some of those, to note, will be extremely popular. For those who have wondered about site readership, I’ll note that daily reading metrics have gotten quite volatile, and unpredictable. Often my best days are the day after I publish an article. But in general, on a monthly scale, this site has seen nothing but steady growth. And hopefully, that growth will continue into the near future. 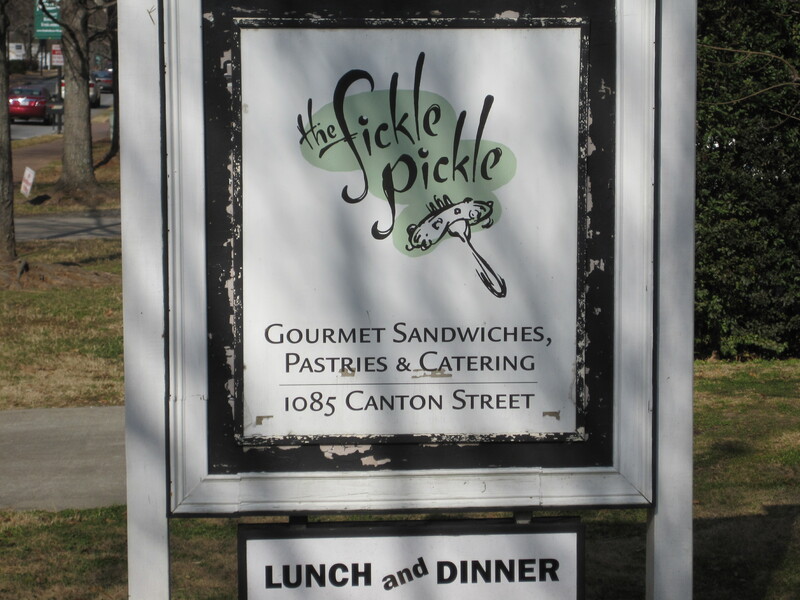 The Fickle Pickle Cafe is found in a gray wood frame house on Canton Street, and as you’re traveling north on Canton Street it’s on the right. Like many other restaurants in along Canton, it’s easy to miss, and the parking is a little haphazard. There is overflow parking on the left hand side of the road, near the Founder’s Hall. 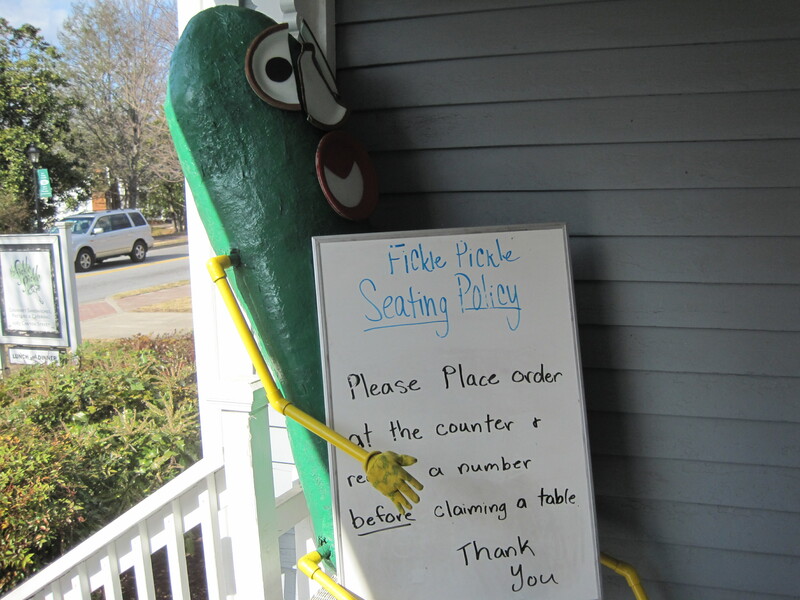 When you enter, you are greeted with a man sized green pickle, and the routine is, once you enter, to find the counter, make an order, are given a number, and then find yourself a seat. I’m pretty sure the Pickle staff is doing this because of the popularity of the eatery. They were scrambling for space when I arrived. And in the room I was finally seated, almost all the other customers were female. 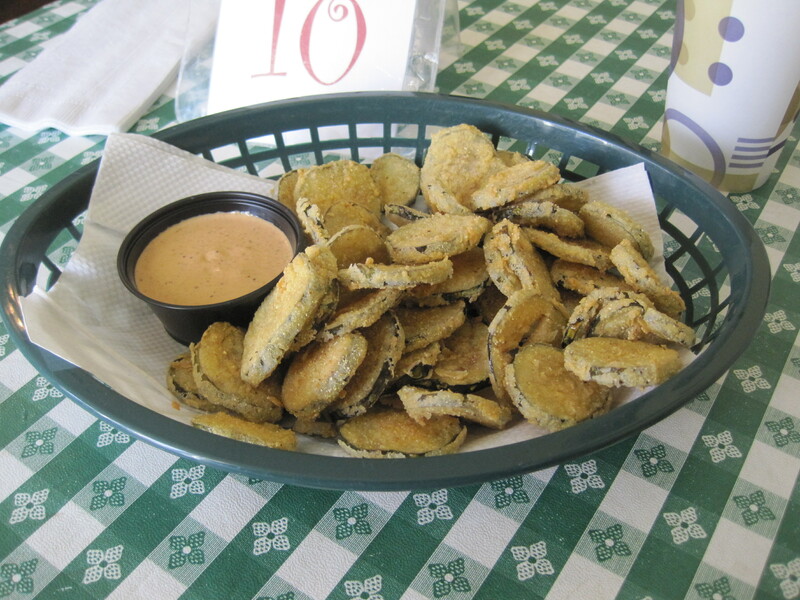 Fried pickles came first. 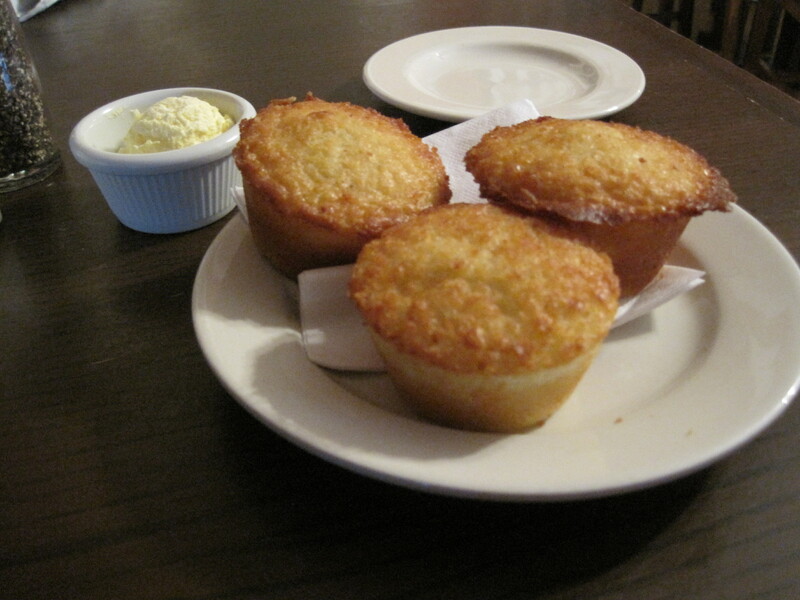 The order in the photograph is just a half order and is almost a meal in itself. They were quite good. 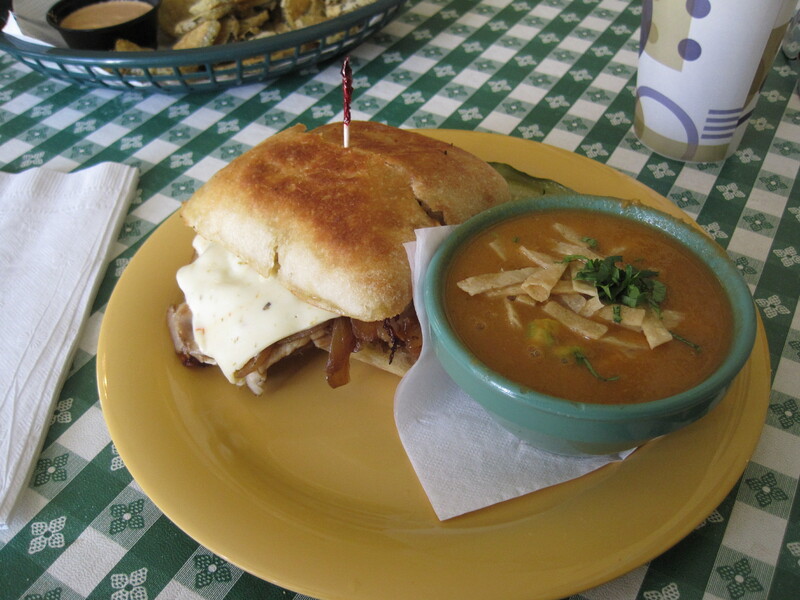 Soon after the rest of my order arrived, the daily special, a pork loin sandwich, and a bowl of chicken tortilla soup. The sandwich was warm, and the toasted ciabatta bread had a pleasing amount of crunch to it. The loin was sliced thin, and at times had a bit of a bacony air. The sandwich itself also had some cheese, melting as I ate, which added rich creamy flavor to the sandwich. The caramelized onions were genuinely brown and caramelized. Overall, I liked the sandwich quite a bit. The soup was good, but the “extras” in it: the chicken, the tortilla strips, the avocado, all seemed superfluous to the soup base. At the core it was a spicier tomato based soup, and was good in itself. The soup didn’t really need any of the other “stuff”. Inside, in the area I was sitting, the color scheme was white and cream and the walls were covered everywhere with art for sale. I enjoyed this restaurant. I enjoyed the food, the atmosphere. It was a bit like a traditional southern tea house during lunch. 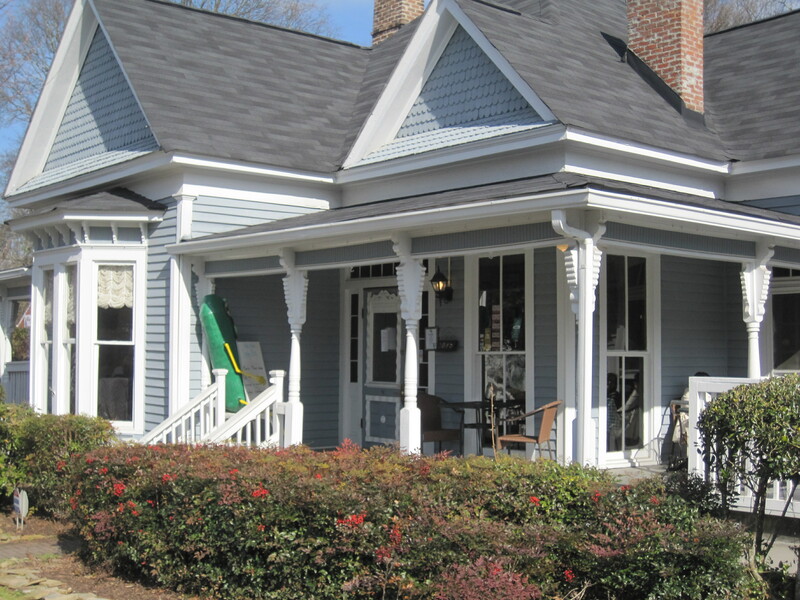 In the evenings they start offering entrées such as shrimp and grits and fried catfish. And the grounds are nice, if you like green and trees, outdoor seating and a look from a time when Roswell was a separate town, instead of part of a vast metro area. Verdict: Fine sandwich shop at lunch, offers Southern foods at dinner. Highly recommended.